Luis T. Puig is an Analyst and a veteran of the United States (nuclear) Submarine Force, with two decades of service during the end of the Cold War, the first Gulf War, some of the conflicts of the 1990's and into the new millennium. He rose through the ranks to reach important positions and be recognized in that unforgiving and technically difficult environment of the U.S. Navy Nuclear Submarine Service as Engineering System’s Expert, Engineering Analyst, Engineering Repairs Planner, Technical Curriculum Developer and Technical Instructor. He received five NEC codes. Above, the United States Navy (nuclear) Submarine Force, former world of the author for two decades. A US Navy nuclear submarine is among the most technologically advanced machines ever built. The combination of computer technology, precision navigation, atmosphere regeneration, sensitive sonar equipment, sound quieting, nuclear power, and precision weapons make for a most unusual environment. Imagine working and living in a 300-foot long, 30-foot wide, three-story building with no windows and surrounded by technology. Then lock the doors, submerge beneath the surface of the ocean and travel silently underwater for months. This requires a tremendous amount of skill, knowledge, personal discipline, and teamwork. Over one hundred crewmembers work and live together for months at a time to defend their country and protect U.S. interests around the world. Submarines operate in the most unforgiving environment on the planet, the crushing depths of the ocean, and they do it with a relatively small number of men. There are about 130 crewmembers on board when a 9,600-ton Seawolf-class submarine heads to sea; an Arleigh Burke-class Aegis guided-missile destroyer of about the same displacement has a crew two-and-a-half times larger, about 340 Sailors. That means that the performance of each and every crewmember on a submarine is vital. Every man must know his job--and much of everyone else's, in case he ever has to fill in--and a host of emergency procedures. And due to those extreme conditions the Submariners are among the most highly engineering and operational trained personnel in the world. “a) Ensures the highest possible standards of individual reliability in personnel performing duties associated with nuclear weapons and critical components. 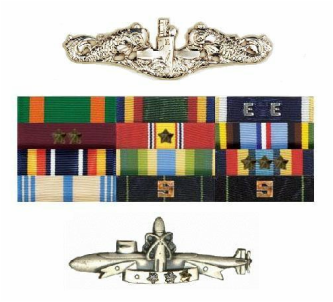 Since all Submariners are volunteers inside the all-volunteer US Navy (meaning no sailor can be ordered to be a Submariner) ALL individuals have to volunteer again (sign additional paperwork) to even just be allowed to begin the long journey to become Submariners and earning the qualifications making them worthy of wearing the “Dolphins Pin”. Also, the US Navy Submarine Force seeks and only accepts out of these new Navy recruits the ones with the highest scores on the initial armed forces entry exam, the Armed Forces Vocational Aptitude Battery test (ASVAB), and a few of the most motivated individuals in boot camp (recruit training), because the qualification process ahead is very rigorous. The Naval Submarine School in Groton, Connecticut is a six weeks long intense Navy school, were the volunteering candidate first learns the basic skills required to operate the complex equipment that fills a modern submarine. They also learn to deal with such emergencies as flooding and fire. They then proceed to more advanced training in their specialties. The Nuclear Power School, for instance, lasts a full year and includes both classroom and hands-on instruction. (From About.com) (http://usmilitary.about.com/library/milinfo/blbess.htm) Here is the typical daily schedule for students at the Navy's Basic Enlisted Submarine School (BESS), conducted at Groton, CT. The 26-day course is required for all enlisted sailors before assignment to serve on a U.S. Navy Submarine. The course covers basic boat's operation, such as boat fundamentals, propulsion, hydraulics, habitability, etc. -0445-0510: Wake-up (variable, set your own alarm). Head call 'n Shave. Iron utility shirt. Make racks. Dress into PT (Physical Training) Gear. -0530-0645: BESS muster. Morning chow (Breakfast). -0700-0750: PT (Physical Training) on the ball field. More rigorous than Recruit Training Command (Boot Camp) PT. (Physical Training) compared to RTC IT (Intensive Training). -0755-0840: Back to room for showers. 8 people, 2 rooms, 1 shower & commode. Dress into Utilities. Clean floor, desks, head, etc. -1045-1145: Afternoon chow. May run to NEX after eating at the galley if time permits. -1600-1750: Evening chow at own choosing, afternoon liberty. -2200: Taps, Lights out, in rack*. *NOTE: On top of that you will most likely have watch (guard duty) on your duty days (everyone stands guard duty once every 6 days) in the middle of the night. You get LESS sleep in BESS (Basic Enlisted Submarine School) than you do at RTC (Recruit Training Command). Many will fail to graduate for many reasons, academic, medical, personal, etc and are either returned to the regular Surface Fleet or discharged from the Navy all together. The next phase of their training will be specialty schools, where the sailors will continue their technical education in more detail according to their job classifications, beginning with “A” Schools as they are called, then they are followed by more intense technical training in the “C Level 1” Technical Schools such as the Basic Electricity and Electronics School (BE&E), followed by Electronics “C Level 1” Schools Pipeline, and the Machinist Mates “A” Schools and their follow on “C Level 1” Engineering School Pipelines for example. These “Engineering School Pipelines” vary in length from a few months to up to a year. The Nuclear Power School and Prototype is the longest and hardest of them all. Schools are located in various US Navy bases around the country, and mostly laid out as college campuses, with different buildings, and various classrooms where the students are taught in increasing levels of difficulty, culminating with hand on facilities trainers and equipment/system(s) rooms simulators. Drop rates (students failing ratios) for the last (3) mentioned, Nuclear Power, Electronics and Machinist Mate schools are high, the highest are in Nuclear Power School and BE&E, with an average drop rate of or higher than of 50%. Degree of technical knowledge of the candidate is high after these schools, allowing the candidates who complete these “Engineering Training pipelines” to earn regular Engineering College Degrees in civilian colleges after completing the various courses at those civilian colleges not given in these military engineering campuses like English, Biology, Literature, etc, courses deemed by the military not necessary for the core knowledge of an military engineer been able to do his duties as an engineer, and/or technician on board a Submarine. A lot of the subjects taught after the initial basics knowledge chapters in each field are Secret, but more general information about the schools can be found for example at: http://www.cnrc.navy.mil/nucfield/, and under “U.S. Naval Nuclear Power Training Command” search in YouTube the US Navy release video: http://www.youtube.com/watch?v=mh-HXQ5r8a8 and for example the Machinist Mates general rating at: http://usmilitary.about.com/library/milinfo/navyjobs/navyjobs2/blmms.htm?p=1. Finally if the candiate survives all of this intensive technical training (up to 50% don’t, and for example Nuclear Power School and BE&E School drop rates are as high as 80%), he will receive a classification code number or Navy Education Code (NEC Code). Then he is ready to be assigned to his first Submarine. If the candidate does not survive the school, then he is sent to less difficult job ratings in the Surface Navy. After graduating from one of these difficult technical engineering schools, then the graduate is ready to be assigned to his first Nuclear Submarine, his first sea duty. As he arrives there he is considered a “NUB” (short for “Non Useful Body” or “Nuclear Unready Body”) because although he has proven himself as a student in those schools he has not proven himself to the Submarine crew by completing the Operational Certifications (or Quals, short for Qualifications) to be able to operate or stand an operational positions/”watches” of the systems in that commission Submarine he has been assigned to. And as a result he is useless to that crew. No one can operate ANY equipment in that submarine until they have completed the rigurous Submarine Qualification Program, which ultimately will earn him the right to wear those “Dolhins” pin. So, the moment the new sailor arrives he would be a issued a Submarine Qualification Card, plus his department Qualifications cards, and he is assigned a “Sea-Dad” or mentor (a senior Submariner) who will guide him through his qualification process. -Construction and support systems for the specific submarine to which the sailor is assigned. -Internal Communication Circuits Systems and components. -Damage Control equipment location and proper utilization is stressed. -Ship's Air Systems, Including High Pressure, Ship's Service and Salvage Air Systems. Each Phase (or "block") of the qualification card has an overall "block review" where the qualifier ties in all the phase's systems and is verbally tested for his level of knowledge. The qualifier must learn and memorize the complete funtioning of all those systems, the proper operations for all those systems without hesitation, and the Casualty Procedures or CPs for EACH of those systems as “second nature” by studying the submarine Standard Operating Procedures and hands on training, since improper operation(s) of an engineering system or an engineering casualty in a submarine if not handled correctly within a few minutes can cost the lives of everyone on board. After completion of all blocks, the qualifier must complete “Compartment Walkthroughs”, where a senior, qualified sailor quizzes the qualifier as they walk through the submarine. The qualifier will be asked about almost every valve, every switch, every component in that submarine and he must answer quickly and most importantly correctly. If all walkthroughs are completed successfully, the qualifier's chain of command recommends that he be examined by a Qualification Board. The qualifier also has to have qualified an onboard watch station, including driving the boat or “Helmsman and Planesman”, which is one of the first positions to be qualified in the Submarine, since it is considered one of the most basic and easier positions, if you can believe that, given that qualifications only get more complicated from there, example Weapons Department Qualifications, Navigation, Reactor Operator, Sonar Operator, Oxygen Generator Operator and so on. Life in a submarine is very hard, the crew functions around an 18-hour work cycle, consisting of (3) Section Duties of 6-hours each. All the crewmembers are assigned into one of those (3) section duties by their department. Like we said before, right after reporting to submarine the qualifying sailor is expected to qualify one of the easier positions on the Submarine so he can start right away to “pull his load” (help with the work load) of the crew. At the same time he has to continue to study submarine system schematics, operational procedures, casualty procedures, memorizing tens of blueprints, etc. The typical crew work rotation goes something like this: on your Duty Section period (say you are assigned Duty Section 1, or D-1) you will be operating and/or watching some equipments, or driving the submarine, etc. Then as you are relieved by the on-coming Duty Section (in this example D-2). Your section, the “off-going” section has then the duties of completing any preventive maintenance of various degrees that may be required or trouble shooting of down equipment that may be needed to be accomplished. Then as the Duty Section 3 or D-3 goes “on Watch” D-1 is supposed to go to sleep and “off-going” D-2 takes over the maintenance work from D-1. Now if the qualifying sailor is behind in his qualifications/studies (which happens often due to department workloads in any section of his qualifications or systems learning) he will not be allowed to go to sleep along with his Duty Section. He will be required to stay up a few more hours to catch up with his learning. Also, if the sleep periods of any of the Duty Sections fall between the hours of 0800 and 1700 hours (5:00 pm) NO one will get any straight sleep, since between those hours are put aside for many different crew Practice Drills (Fire drills, Combat Scenarios Drill, Reactor Casualty drills, etc) which are run on the crew to keep them sharp and proficient. On top of this, the oxygen levels in a submarine are kept a bit lower than normal atmospheric levels (which is normally around 20.8%) to help flammability points of all things in the submarine be a bit higher, thus preventing fires a bit more, but the result on the personnel is that your body gets more tired and lethargic. Then at the same time all of these things are going on, the qualifier will be pulled away from the normal Duty Section rotation and his department for a “special” period of time, since he also has to fulfill his “time” as a “crank”, or help for a time with the dirty jobs of the Scullery and the Laundry Department on board the submarine. ALL newly arrived sailors to a submarine MUST complete a total of approximately 40 days of scullery and laundry service onboard ship, no matter what your job description is or rank. So, a typical qualifying sailor will get very little sleep, while under extreme pressure by being pushed to learn complex engineering concepts, and qualifications under lower than normal oxygen conditions which will make him feel even more tired. This is one of the hardest and most demanding technical learning environments on the planet. Some do not survive this initial qualification environment, and are discharge from the Submarine Force and sent to the surface fleet. But the ones that survive then go up to the Final qualification Board. The Final Qualification Board is encompassed of the Commanding Officer (or CO), the second in command officer (known as Executive Officer or XO), various Department Heads, such Engineering, Weapons, etc. and senior Enlisted Officers such as the Chief Of The Boat, etc. The Final Boards can last up to 5 hours in which time the qualifying sailor will be asked detailed questions about all the systems of the submarine and expected to explain them in equal detail, including drawing from memory all the systems blueprints, etc. If you survive that, then and only then you are qualified in submarines and are allowed to wear the “Dolphins” pin… but this is only the beginning. After having tasted this hard world, many only serve one enlistment and then leave the Submarine Force. After receiving your “Dolphins” qualification the journey for those brave enough to stay in the Submarine Force continues. Next, (and most of the times while still attached to the submarine crew) and if the sailor demonstrates a great motivation and attitude for learning and being a “go getter”, he can be offered to attend higher level technical schools related to his job field or as they are known “C” schools Level 2 and 3. These courses differentiate in that Level 2 courses are usually to teach the trainee up to Maintenance or Systems Expert level knowledge such as System(s) Trend Analysis, System(s) Performance Analysis, Systems Managing and Maintenance Planning and Work Center Leadership/Management courses among others. At the Level 3 courses are usually to teach and certify the sailor as a Technical Instructor in their fields. Upon completion of those courses additional NEC Codes (Certification Codes) and/or “Certificates of Completion” for example will be granted. Generally a typical submariner will have between (2) and (3) NEC Codes by the time he reports to a submarine, but the more senior submariners will have (4) or up to (5) NEC Codes. As the years go by, and the Submariner continues his career, he will be rotated form Sea Duty (submarines service) to Land Duty (member or leader of Navy repair crews) becoming more and more senior, and with more expertise and managing experience. He will also be required to attend Navy wide Management Courses in order to be allowed to advance to more senior command positions. These courses teach among many other things the intricacies of Management and people skills in addition to all other useful required knowledge of a good Department Manager. Later, and using those newly acquired more advanced technical and managerial skills, he can continue working his way up to earning the right to go to one of the many Engineering field Instructor Schools to earn the certifications to become an Instructor himself, and later even a Submarine Force Repairs Planner, which is the equivalent of Systems Engineers in the civilian world. Submarine Force Repair Planners are in charge of Developing Quality Control Engineering Repairs Procedures called “Controlled Work Procedures” or CWP. It includes Objective Quality Evidence (QA Forms, Blueprints, Testing Requirements, etc. ), directing engineering repair teams in the delicate work of repairs work onboard nuclear submarines. A typical U.S. Navy Submarine Force Engineering Planner (Electrical Planner or Mechanical Planner) is involved in the planning of repair jobs of existing engineering systems or engineering alterations/modifications (Ship Alts) to existing systems in a nuclear submarine. He is in charge of developing from beginning to end the entire job sequence in the repairs or the modification(s) of a nuclear submarine system. The Planner is in charge of the overall manpower direction/allocation by determining what Engineering Departments will be required for the job, at what point of the job they will be required, what will their jobs be, and specifying it in detail in a step by step manner in the Engineering Procedure what their functions and jobs will be in the repair job or alteration job of the involved system(s) in the nuclear submarine. (By the time a Submariner has reached this point in his career the US Navy has spent close to a million dollars in his technical and managerial education. Try to match that kind of money spent on a technical education in the civilian world). The requirements for the personnel training and work under those Quality Controlled Engineering Repairs Procedures called “Controlled Work Procedures” or CWPs are part of the US Navy Submarine Force Quality Assurance Program or “Subsafe Program”, developed in the 1960’s by Admiral Rickover, the father of the worlds’ Nuclear Propulsion, as “lessons learned” after costly accidents due to bad management and bad work quality controls onboard nuclear submarines which cost the lives of all onboard those submarines. The US Navy Submarine Force Subsafe Program is among the strictest Engineering Quality Control Program on the planet. It encompasses ALL aspects of engineering evolutions, from material control, system design control, operational requirements regulations, parts inventories and personnel training among others facets of any engineering evolution(s). Many Quality Assurance Programs have been modeled later after the US Navy Submarine Force Subsafe Program, including the widely adopted civilian ISO Quality Assurance Programs among others. Corporations like “The Aerospace Corporation” http://www.aero.org/conferences/sseae/forum3-7-06.html also are adopting and giving conferences on the US Navy “Subsafe Program”. The goal of the program is to catch and eliminate mistakes that can cost catastrophic accidents and/or systems failures. The Qualifications to become a Submarine Force Repairs Planner under the guidelines of the US Navy Subsafe Program are high and require first to have completed certain required NEC Codes and/or Certifications. And just like in the qualifications for the Dolphins Pin, the knowledge requirements are immense and the final qualification is also given after passing a Qualification Board. And thus, reaching positions such as U.S. Navy Submarine Force Engineering Repairs Planner like Mr. Puig did is one of the final and highest Engineering Qualifications a Submariner can have as an Enlisted Personnel in the Nuclear Submarine Force Engineering world, and an indication of a highly analytical mind. The Amateur Scientists, is it rare? Cases like this were amateur scientists and/or plain professionals in one field like Mr. Puig are making discoveries in other fields, but their findings are ignored and even blocked is not new. The article “The Plight of the Obscure Innovator in Science” by Moti Nissani @ (http://www.is.wayne.edu/mnissani/PAGEPUB/HISTORY.HTM) for example shows that all throughout history there has been resistance to new ideas by scientists and the public. Individuals like Michael Faraday, who started by working as an assistant to Humphry Davy (and was treated as a servant) went on to become the world’s foremost authority on electromagnetism, discovering diamagnetism, electrolysis, and electromagnetic induction, among other things. The list of individuals in this situation goes on, Thomas Edison, Robert Evans, Henrietta Swan Leavitt, and many others all were amateur scientist who made great contributions to science and learning, but who had to endure and overcome resistance from the scientific establishment and the public. The article goes on to do an expose of individuals that have made important contributions to science even though they are not full time professionals in the fields of science they have made the discoveries on. People like Ron Bissinger for example from Pleasanton, California who is the man who proved that detecting exoplanets—planets that orbit distant stars—which was done only at professional observatories could also be done by amateur astronomers. He was able to confirm the existence of exoplanets HD 149026 b, “one of the smallest and densest transiting planets yet detected” according to the article. So, for someone like Luis T. Puig to have made an analysis of a topic not directly related to his profesional fields, and to discover something new is not rare or unheared off. All that is require for his analysis in the study of homosexuality is an open mind and a willingness to hear the facts found and presented by Mr. Puig about the subject.